I became friends with Russ Nottingham last year on Facebook. I really enjoyed his music as well as found him to have such a heart for God and ministry. I was blessed to meet Russ and his beautiful wife Jeri in Nashville at the Inspirational Country Music Awards week. I am very blessed to be connected with them. I believe God has orchestrated one of His divine connections once again in my life and the ministries I am involved with. I was so blessed to be able do this interview with Russ Nottingham. I believe that you will fall in love with Russ Nottingham Ministries after you read this blog. When you are finished reading this please go straight to his links provided here. Listen to his music on reverberation and then go to his website and order your own Russ Nottingham cds. Russ Nottingham is a Christian singer, songwriter and musician. 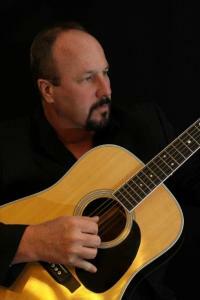 His inspirational music is a blend of his lifelong influences, from Country to Southern Rock, from Bluegrass to Jazz, and just about everything in between. Russ: “I was raised in a Christian home with a praying and believing mom and dad. But as I grew older, I decided to do my own thing, and I began playing out in bars and nightclubs”. After a few years, Russ joined a Country band, which shortly began growing with recognition. They spent weekends opening for stars such as Conway Twitty, Johnny Cash, Diamond Rio, Charlie Daniels, Vince Gill and many others. It was looking like the Country music dream was becoming reality. Things were looking pretty good! “I must honestly say that it was exciting at times. But as time went by, I began to realize that I had an uneasy feeling inside. I felt emptiness, like there was something missing. The worst part was, deep down, I knew what that something was, but I just wasn’t ready to accept it”. As achieving the dream drew closer, God’s calling on Russ’s life became clear. “The more we traveled, the more I began to get homesick and miss my wife and kids. The more exposure we gained, the less exciting it became. That’s when I realized that even though I had turned my back on God, He still cared for and wanted me back. So, over a period of a few months, I ended up resigning from the band and both my wife (Jeri) and I along with our two boys (Rusty & Michael), rededicated our lives back to God and here I am today, years later”! Russ’ catchy music and encouraging lyrics in his original songs reflect on the unconditional love and relentless pursuit of our Heavenly Father. Through all of our faults and failures, we are never out of God’s reach. This is the lifelong testimony of Russ Nottingham. Russ Nottingham Ministries goals and objectives are to make a positive impact in people’s lives through his songs on how God forgave him for all his sins in his past and to encourage the loss to change their lives by letting them know that it is never too late to ask for forgiveness and that God is waiting to accept them back into his fold. Russ’ goal is to travel from state to state and country to country singing about God’s great love for all of us. What artist would you say has influenced your music the most? Russ: Actually my music is a blend of all the different genres that I grew up listening to. It’s a little bit of Bluegrass, Country and Southern Rock all rolled into one. As far as influences. I definitely liked the Eagles, Lynyrd Skynyrd, Alabama, Diamond Rio, Ricky Skaggs. Russ: My song “Maybe”. Not sure what radio station. The song was released through HMG/Power Source and they sent it out to over 1000 different stations. Russ: The first time I seen someone give their heart to God through my music, I knew that’s what my calling was. Russ: The desire to serve God and the joy of singing and playing music. Do you have any new projects in the making? Russ: Yes, I am working on songs for a new cd. It’s not titled yet though. What’s your current single on the air waves that we might hear? Russ: Yes, I do all original music. What is your personal favorite out of all the songs you have recorded or sing? Russ: At this time I would have to say “Maybe’. Just because it’s my current single. Can you share one of your funniest memories of Singing on stage or while recording? Russ: When I went to Nashville to record a couple of years ago, I was given the address to the studio which I thought was in a house. So I knocked on the door and a few minutes later an elderly gentleman answered. When I looked up there stood this guy in an old pair of them old, real short, gym shorts. It appeared, I had awaken them. The man is a well known singer (I won’t mention his name). Anyway he said the studio was around back. Later in the day he came out to the studio and said he had better introduce himself since I practically seen him naked. I must admit it was a little awkward, but we all had a good laugh. What is your favorite scripture and what does it mean to you? Russ: John 3:16 God loved me so much that He let His only Son die for me. The best part is He died not only for me but for everyone who believes. Thank you so much Russ for sharing your heart and ministry with us. This entry was posted in Uncategorized and tagged Christian Country Music, country music, Faith, Inspirational Country, ministry. Bookmark the permalink. Russ Is A Great Man Of GOD & Good Friend Of Mine, Thanks For Having Him. Thank you so much Cassie! We appreciate all that you are doing for us and our ministry! Your so welcome. Thank you for the opportunity.